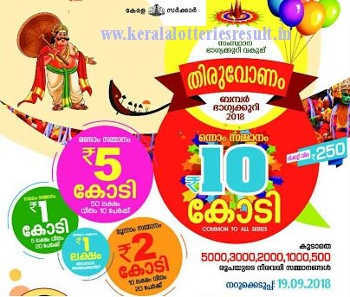 Thiruvonam Bumper Lottery is one of the popular bumper lottery conducted by Kerala Government lotteries department. Kerala State Thiruvonam Bumper Lottery 2018 ticket sales has been started on July, 2018. 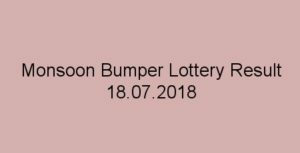 THIRUVONAM BUMPER BR 63 Lottery Result of Kerala state lotteries draw held on 19.9.2018 (19th September 2018, Wednesday). The prize structure of Thiruvonam Bumper 2018 Lottery has published. 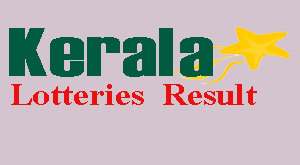 The Kerala lottery draw of Thiruvonam Bumper 2018 (BR 63) will be held on 19.9.2018 and the Thiruvonam Bumper BR-63 result will be declared on September 19, 2017. BR 63 Thiruvonam Bumper tickets will be available on 10 series TA, TB, TC, TD, TE, TG, TH, TJ, TK, TL. Thiruvonam Bumper Lottery Result 2018 will be published at Today 19.9.2018 after 3.30 PM.